The European Union (EU) has been widely condemned for its neglect of the growing number of people trying to cross the Mediterranean from Africa, mostly in unseaworthy boats, to seek refuge in Europe. Nearly 25 000 have arrived illegally in Italy alone this year. Although that is not much greater than the number who arrived during the same period last year, the death toll had rocketed from under 100 to the end of April 2014, to about 1 000 so far this year. And that was before the catastrophe on 19 April, when as many as 800 people also drowned after their boat collided with the Portuguese freighter King Jacob, coming to their rescue. One reason for the increased deaths is that Italy, which receives the brunt of the illegal immigrants trying to take the shortest route to Europe (from Libya to the island of Lampedusa), has significantly scaled back its rescue effort as part of Mare Nostrum last year, under pressure from right-wing members of the Italian governing coalition. It was replaced by the EU’s Operation Triton, which has far fewer resources. Jolted into action by the 19 April tragedy, EU leaders met on 24 April and agreed to triple the budget of Operation Triton and significantly increase the numbers of ships and aircraft participating in it. But the increased finances only returned the budget to the level of Mare Nostrum and, critically, the EU leaders could not agree to distribute refugees more equitably among member states – though that is still under consideration. Under the present ‘Dublin rules,’ the countries where the asylum-seekers land are responsible for them. Southern European nations like Italy and Greece bear a disproportionate burden. All in all, Amnesty International dismissed Europe's response as a ‘face-saving not a life-saving operation.’ No doubt the EU should have done much more. ‘But unfortunately the current political dynamics in some European countries mean that short term solutions are likely to win out,’ says Anton du Plessis, Managing Director of the Institute of Security Studies. So the EU will probably take stronger action against the ruthless human traffickers who ship the desperate asylum seekers at exorbitant cost and sometimes deliberately in leaky vessels, counting on the Europeans to rescue them. This could include destroying their boats. As Du Plessis suggests, the crisis has deep roots: in the Arab Spring and in Africa’s chronic underdevelopment and misgovernance. The largest number of illegal border-crossings to the EU last year from any single nation, about 68 000, was from Syria, followed by Eritrea with about 34 000. Of the total of about 180 000, slightly more than half came from Africa, including Mali, Gambia, Nigeria, Somalia and Senegal. The problem is greatly aggravated by Libya, the main departure point of the asylum-seekers, being a largely ungoverned space since Western powers toppled Muammar Gaddafi in 2011 without much thought to the future. But as Du Plessis also suggests, more attention needs to be given to what the other side of the Mediterranean, the African Union (AU) and its member governments, are doing or not doing about the problem. They also, surely, bear some responsibility for the migrants' fate: in at least two respects. They control the launching pad, as it were, for the swelling wave of boat people. This means that the AU and the relevant governments could shut down the complex web of smuggling routes crisscrossing the Sahara and West and East Africa. She also pointed to the deeper causes, poverty and underdevelopment, which she said called for ‘urgent regional and global action,’ including dialogue between Africa and Europe to find ‘comprehensive, durable, and holistic’ solutions. Yet there is no sign of a coherent AU policy to tackle this crisis. Nor was an urgent summit of AU leaders called to address it, like that of the EU. Nor did it feature among the decisions and declarations of the most recent AU summit in Addis Ababa in January this year. And most AU members are very far from acknowledging the misgovernance and repression that encourage their people to risk everything to seek a better life elsewhere. Ironically, it was President Jacob Zuma who this week fingered African governments as being a major push factor in illegal migration and said the AU needed to discuss the issue. But he was talking about the African migrants who flee south to South Africa, not north to that other Shangri-La, Europe. Zuma and his government have been identifying many other scapegoats for the xenophobic violence, including apartheid, the media and conspirators trying to discredit the country. None of these justify violence against foreigners. Yet clearly the parlous state of the countries that migrants come from is a factor. That is why Zimbabwean President Robert Mugabe’s criticism, in particular, has been so galling – since it has been his disastrous political and economic misgovernance which has launched so many of his people across the Limpopo. The irony of Zuma’s Freedom Day speech was not lost on European diplomats. 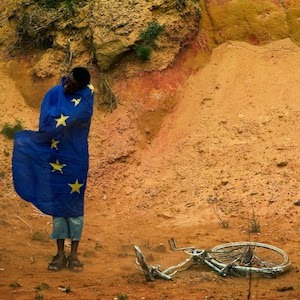 Zuma is wont to criticise EU policies towards Africa as neo-colonial. Now he finds himself in a rather uncomfortably similar predicament – as the object of sharp criticism for mistreating desperate African migrants. ‘Welcome to our world,’ said one of those diplomats, wryly.